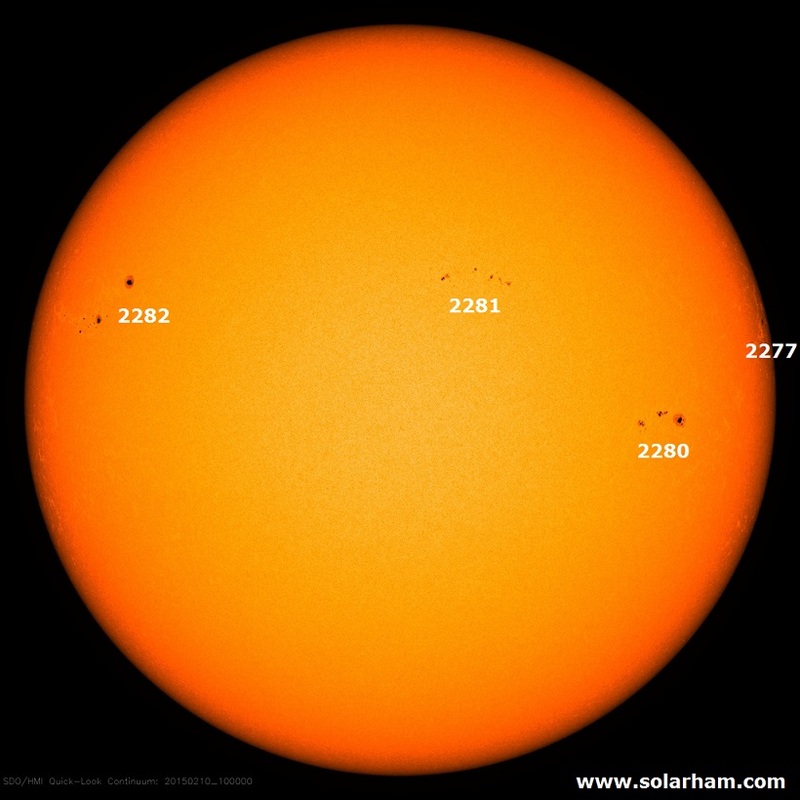 The Solar activity is currently active. Solar flaring activity was moderate. AR 2282 located on the Eastern hemisphere (E51) produced an M2.4 flare on 2015-Feb-09 peaking at 23:35. In addition, several low level C class flares occurred in the past 24 hours, originating from NOAA regions 2277, 2280, 2281 and 2282. The M flare had a halo CME associated with it. The CME was first observed in LASCO-C2 and C3 coronagraphs at 23:24 UT on 2015-Feb-09 and the main component propagated to the East with an estimated velocity of approximately 1000 km/s. Although the CME is largely moving to the East a shock front may interact with the Earth raising KP to 3-5. The flank of the CME is expected to arrive at Earth on 2015-Feb-13 00:00 UT +/- 12 hours. Flaring is expected to be active with several C class flares, and the possibility of M class flares. The Halo CME may increase the proton activity level. Solar wind speed is fairly constant, at around 450 km/s. The density has seen a small fluctuation and there appears a small rotation in the magnetic field. Total magnetic field remained constant around 6 nT. Bz was variable fluctuating with negative peaks down to -5 nT. The phi angle was positive. Geomagnetic conditions were quiet to unsettled (NOAA Kp 1-3, local K Dourbes 0-3). Slightly enhanced solar wind conditions are expected to persist and possibly enhanced in 24-36 hours if the CME/shock front produced at 23:24 UT on 2015-Feb-09 interacts with the Earth. Geomagnetic conditions are expected to be quiet to unsettled with an isolated active period possible.